Imagine… its you, the lobster and your tickler - who wins? 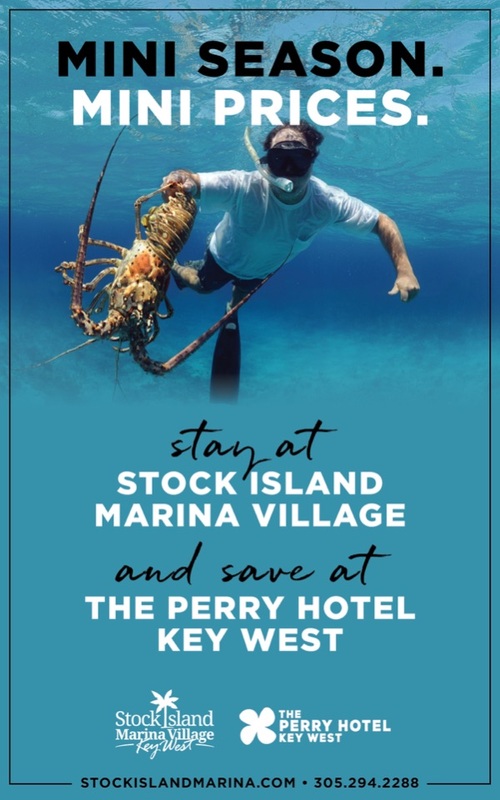 You do (of course), if you join us this Mini-Lobster season in Key West at the Stock Island Marina Village which runs July 24th and 25th, 2019. One of the most popular fishing traditions of the year - this event is a right of passage for many native Floridians and for many more who might wish they were. An always popular fishing destination, each year the Florida Keys becomes packed with Lobster enthusiasts, looking to beat the crowds and be the first to get their hands on fresh Florida Spiny Lobster. The regular Lobster Season runs for a total of eight months between the beginning of August all the way to the end of March. Mini-Lobster Season kicks off every July with a two day event taking place on the last consecutive Wednesday and Thursday of the month. This years’ mini-season will take place on July 24th and 25th. Check out the Mini-Season rules and regulations here. Make sure you don’t miss our exclusive Mini-Season Boat & Stay package: Reserve your slip for 3 or more nights at Stock Island Marina, and receive 25% off your stay for 3 nights or more at our award-winning Perry Hotel. In addition, enjoy complimentary lobster tail preparation (up to 2) at Matt’s Stock Island Kitchen & Bar. Reserve your slip at the Stock Island Marina Village today!